German Foreign Minister Sigmar Gabriel has reiterated German support for the Normandy format. He told Russian President Vladimir Putin clashes would go on until an international settlement is reached in eastern Ukraine. German Foreign Minister Sigmar Gabriel said at a meeting in St. Petersburg that new top-level negotiations talks were needed to resolve the ongoing crisis. "We have the hope that it will continue in the Normandy format, right up to the level of the heads of state and government," Gabriel said early Saturday after meeting Putin and former German Chancellor Gerhard Schröder for dinner at Putin's residence near St. Petersburg on the Baltic Sea. The so-called Normandy Format of four countries has seen three years of Germany and France try to mediate between Ukraine and Russia - so far with little success. German Chancellor Angela Merkel met Putin in the Black Sea resort of Sochi recently, signaling renewed dialogue between Berlin and Moscow. Merkel has strongly backed EU sanctions on Moscow for seizing Crimea from Ukraine in 2014 and backing the pro-Russian separatist insurgency in the east of Ukraine. Russia has responded with an embargo on agricultural products from the West. Russian president, Vladimir Putin, and Germany's senior diplomat Sigmar Gabriel meet in Russia on May 3. The Normandy format was created to resolve the situation in the east of Ukraine. 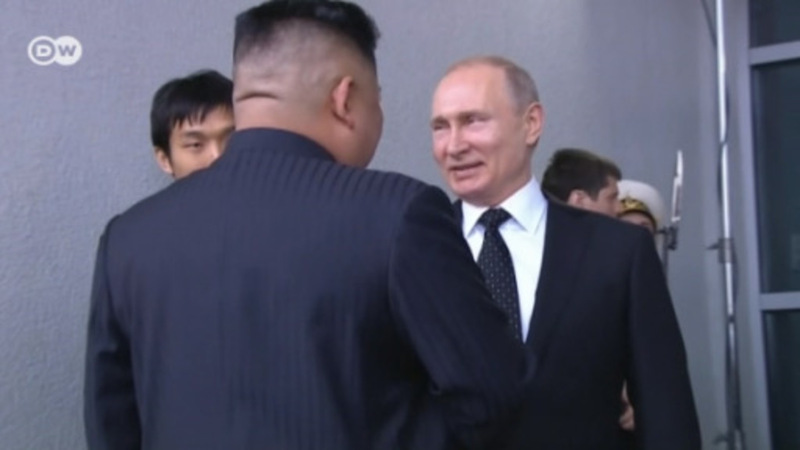 It was set up on June 6, 2014, when France, Germany, Russia, and Ukraine leaders met on the margins of the 70th anniversary of the D-Day allied landings in Normandy. Ukraine has been involved in a conflict with Russian-backed separatists for over two years in the eastern Ukrainian region known as Donbass. A number of Ukraine's allies, including Germany and the wider NATO alliance, have tried various diplomatic efforts to end the conflict. That includes the Minsk agreement - a ceasefire agreement brokered by Germany and France between the separatists and Ukraine that has been on the table for two years. In May, Russian Foreign Minister Sergey Lavrov and Gabriel reiterated readiness to continue Normandy-format efforts towards settling the situation in Ukraine. They stressed the necessity to ensure sustainable ceasefire, to establish security zones and withdraw heavy weapons from the contact line in Donbass. Also in May the US said it might join the Normandy format, Ukrainian Foreign Minister Pavlo Klimkin said. The Ukrainian economy lost 20.4 percent of GDP in 2016 due to the Donbass conflict, according to the Global Peace Index Report published by the Australian Institute for Economics and Peace in Sydney. Ukraine thus ranks top of the list of countries suffering economic losses because of armed conflicts. Schröder, a good friend of Putin's, worked closely with the Russian president during his term from 1998 to 2005 and after being voted out of office quickly took a post on the supervisory board at the Nord Stream gas pipeline consortium and the board of directors for Nord Stream 2, where Russia's powerful gas monopoly Gazprom is formally the sole shareholder. The withdrawal of the United States from the Paris climate protection agreement also came up in Gabriel's conversation with Putin. Gabriel indicated that Germany's Environment Ministry had agreed to stronger cooperation with Russia on climate change. Speaking about Putin's position on the subject, Gabriel said, "I am firmly convinced that such agreements between Russia's environmental sector and the German Environment Ministry guarantee the acceptance of the Russian president." German Foreign Minister Sigmar Gabriel is set to visit the areas near the Ukrainian frontline during a two-day trip to the country. He is expected to discus Berlin's diplomatic role in "countering Russian aggression."